Not much is known about e-cigarettes and the dangers which accompany the devices. Many argue that they are healthier than traditional tobacco products, but there is still a high risk of nicotine addiction. The federal government has not mandated that e-cigarettes have warning labels, yet big tobacco companies which own their own e-cigarette products have begun placing warning labels on the devices. Critics of the tobacco industry are questioning the motives of big tobacco companies who have issued strong voluntary warning labels on their e-cigarettes, according to The New York Times. In many cases the e-cigarette warnings are stronger than the warnings they place on their traditional tobacco products. “Is this part of a noble effort for the betterment of public health, or a cynical business strategy? I suspect the latter,” said Dr. Robert K. Jackler, a professor at the Stanford School of Medicine who studies cigarette and e-cigarette advertising. 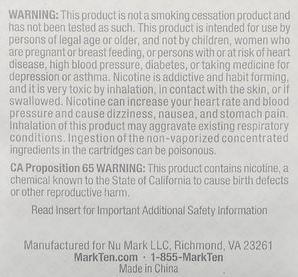 It is interesting that the warnings on the back of Marlboro's packs fail to mention the addictive nature of cigarettes, or that the use of cigarettes can lead to fatal health problems like heart disease and cancer. “Why wouldn’t you warn about ‘very toxic’ nicotine in your cigarettes when you do so on e-cigarettes?” said Dr. Jackler.